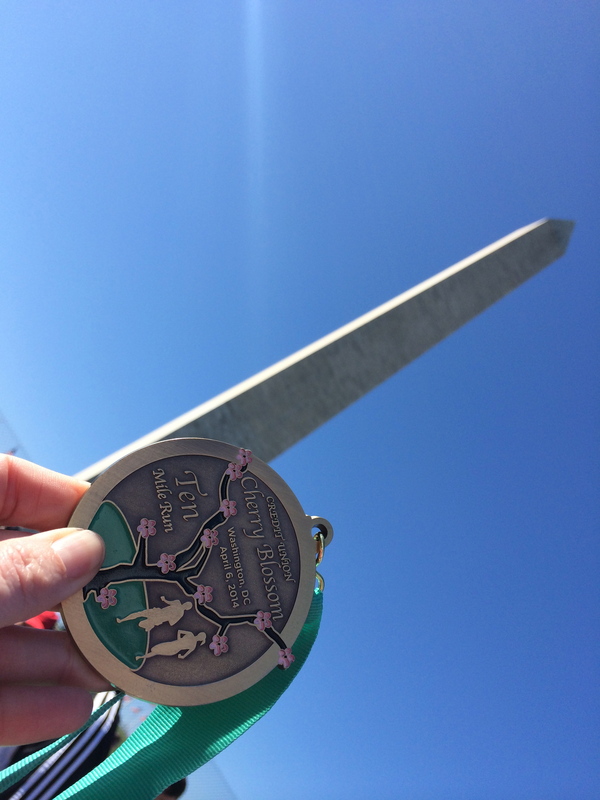 Prologue: I’ve been looking forward to the Cherry Blossom 10 miler in DC for months. So excited to see the blossoms on this lottery run. A run that thousands of people try to get into and Kristine and I were chosen in our first time entering the lottery. I was a little worried the last couple of weeks that there wouldn’t be any because of the late ending winter – but luckily we saw some yesterday around the White House en route to the expo. Yay! There were going to be these beautifully blossomed trees to run through along the river and the paths! Side note: The expo was held in the National Building Museum – gorgeous! Well organized and a decent amount of vendors. So we get all staged this morning, started running and blah, blah, blah – blossoms nowhere to be seen. Yes, there were tiny buds on many trees, but basically nothing, nada – the whole way through except for three trees at the start/finish area. Don’t get me wrong, the run was still along a nice route, but I was still bummed. So to make myself feel less disappointed and commemorate the namesake of the race, as I was running my last three miles, I envisioned the most beautiful blossoms during a “regular” spring run, surrounding me on the path. I visualized the pink hues and imagined the perfumey smells wafting in the air. And that was lovely. Bummer 2: My right knee basically gave out on me just before mile 6. There was no compromising with it – it would not stretch, I couldn’t rotate it out, zippo. I don’t usually stop running even with some pain, but I had to go to the medic tent. I sacrificed a decent time to sit with the medics for 10 minutes and ice my knee. The girl wrapped some kind of funky non-stick tape around my knee to hold the ice pack in place and then I ran the other four miles. Yep, a bit wobbly and with that ice pack taped on my leg creating a bulge under my pant leg. But I ran; I would not walk across the finish line. Bummer 3: There was no food except bananas! What? How were we to replenish ourselves? Are you kidding?! Bananas? And watered down Gatorade? Apparently there were also granola bars, but I guess they ran out… Bummer again. So the moral of my story is: enjoy the scenery, clutch the nice medal at the finish, then go for brunch with a friend and forget about the disappointment because life could be worse. Shame about the lack of blossoms and knee but nice visualisation! Yes, I had to visualize it! Helped me through some of the pain too!